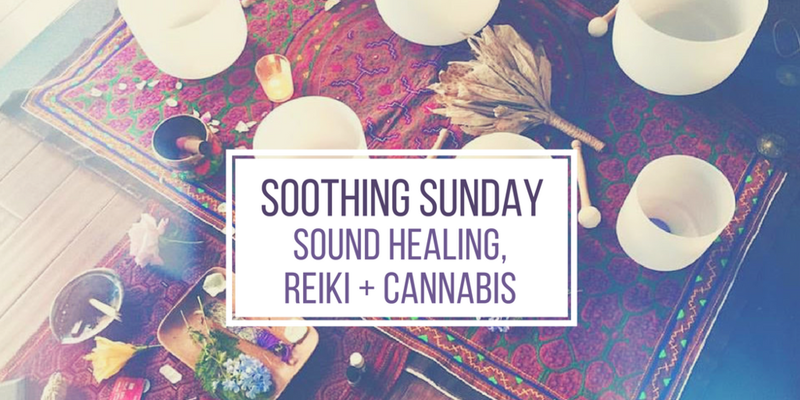 Let us treat you to a 3-hour immersion in relaxation, healing, and soulful nourishment via sound healers, Reiki masters, masseuses, tea, light noshes, and… cannabis. This consciously designed and curated experience will have your worries melt away while we connect to the healing frequencies of the universe, our highest selves, and an amazing community of elevated souls. After setting an intention for our time together, Nicola Buffa, Sound Practitioner + Vibrational Healer + Artist, will lead us through a journey to uplift our spirits and help wash away that which is no longer serving us through the powerful transmutation of Sound. During this ceremony, Becca Davis, will also move around the space adding in an additional layer of intuitive Reiki healing. Following the ceremony, we will have tea, kombucha, and light noshes while attendees get one-on-one work with either Nicola, Becca, or one of our massage therapists onsite for either massage, reiki, tuning forks, or an aura cleansing. This comprehensive healing event will lift your spirit and lighten your soul as we enjoy these long days of summer. What to Bring: We suggest wearing something warm or bring a blanket, yoga mat to lay on, pillow to rest your head and an eye mask if you prefer but its not mandatory. 4. Upon check out - if you are not already an existing SAVA customer, you will need to sign up. You will need to select “I am over 21 years of age and do not have a doctor's recommendation” if you do not have a doctor’s recommendation note. SAVA is licensed to sell to adults over the age of 21. *You will not incur a delivery fee. Following these instructions will ensure your package will be delivered to the event location on time for the event. The event location will be emailed to package purchasers on the morning of the event. NOTE: Remaining cannabis product(s) in your package not consumed on-site will be yours to take home at the conclusion of the event. Sava delivers a curated selection of quality cannabis to your door, along with the support and education you need to use cannabis for wellness. Nicola Buffa is a Sound Practitioner + Vibrational Healer + Artist working to bring Upliftment to those suffering from alienation, chronic discomfort, and stress related anxiety, and to assist the natural creative spirit of our collective consciousness through the powerful transmutation of Sound. Offering relief through Sound Healing. Sound treatments incorporate BioField Tuning, Color Therapy, Healing Voice, and Guided Meditation with Alchemy Crystal Singing Bowls, Gong, and Tuning Forks. She believes that with the gentle adjustments and transmutations from sound therapy, we can Return Ourselves to our True State of Being; Creative and Joyful. Becca Davis began her personal journey into the holistic healing arts when she was introduced to yoga in 2006. Since then, she has received her Yoga teacher training certification completing 500 hours of training, and is a Reiki Master Teacher. She provides private healing session as well has holding sacred circles where she resides in Marin, and also has a healing space in Oakland. Drawing on her own inspiration and experience with the healing power of sound, she helps guide the listener to open, balance and expand the natural state of the vibrational rhythms within the body, mind and the spirit. She is inspired to serve others along their journey to finding their highest potential.